A look from the 80s that's now back in fashion, own your own piece of iconic history with Oakley's Frogskins Sunglasses. Designed with Oakley's signature Three Point Fit, this helps keep the sunglasses securely in place for precise optimal alignment. A patented innovation that ensures the frame makes contact only at the bridge of your nose and sides of the head. 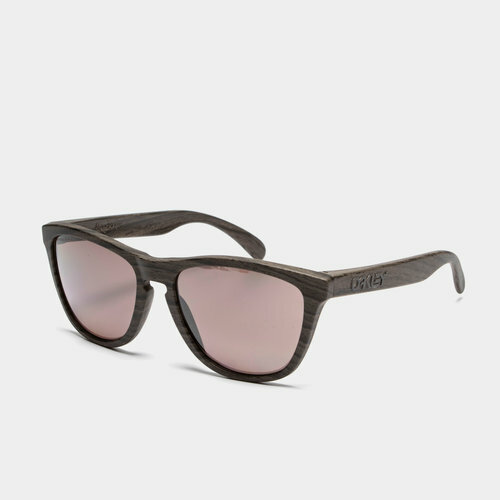 When it comes to the supremely lightweight frame, O-Matter brings a stress-resistant material that has been developed to withstand environmental extremes. Controlled flexibility enhances impact resistance while contributing to the all-day comfort. As well as looking and feeling good, UV protection is provided through the Plutonite® lens which filter out 100% of UVA/UVB/UVC and harmful blue light up to 400m. A grey look to the frame incorporates the Oakley brand raised in white for added distinction atop each arm. Complete with a Microclear™ bag for lens cleaning and frame storage, check out our complete sunglasses collection.